One of the problems with having a specific plan in mind is that when things dont go right, its harder to rebound... so we wandered around for a little while looking for alternatives and eventually ended up at Franny's. The next night was our traditional pasta night, so we thought 'why not try to re-create last night's pasta???' I'm never good at this game, but I figured why not? Turns out we hit the nail on the head... Squarely on the head. I have no idea if our ingredients or methods were the same, but i can tell you this - the similarity in taste was remarkable... Another light and easy pasta, in the books. 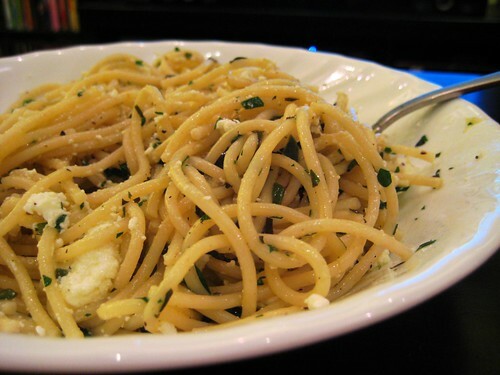 While spaghetti is cooking, melt butter & heat olive oil in a large frying pan over low heat. When butter is fully melted, stir in poblanos and garlic. Saute for 2 - 3 minutes, stirring once or twice. Allow to saute another couple of minutes, again stirring once or twice. Add another ~ 1/4 of pasta water if desired. Drain pasta and add to frying pan. Toss together until spaghetti is well-coated with the oil/butter mixture. Stir in herbs. Toss again to combine. Separate onto two plates and top each with half of the ricotta. Serve with a baguette and a couple glasses of wine. Really, what else is there in life? Fresh basil and good tomatoes are about to become much more difficult to find, so you might as well go ahead and make this sooner rather than later, because good ingredients are key in something this simple. Seriously, stop reading. Go cook. Preheat oven to 350° and lightly grease a baking dish. Cook pasta about 2-3 minutes less than it says on the box. Just before pasta is done, heat pasta sauce in a large pan over low heat. Stir in the cream and Parmesan. Allow to simmer for a few minutes. Once pasta is ready, remove the sauce from the heat and stir in pasta. Add mozzarella cubes (but not the rounds), the tomatoes and the basil and stir to combine. Pour the mixture into the baking dish and top with mozzarella rounds. Bake for ~25 minutes, until cheese is just a bit golden. Allow to sit for a couple of minutes and then serve. A few weeks ago, a friend and I were having what could only be described as a riveting conversation about tofu. But no... It turns out, you can buy fresh tofu... and apparently its better... so on my next coop visit, i looked into this fresh tofu thing and when i found some, i bought it. right away. Oh, and a bonus? We FINALLY used our rice cooker... we've only had the silly thing for a year and 10 months now... Banner day in our household, huh? Toss tofu cubes in a bowl with cornstarch to coat. Pan-fry tofu all over, until golden on all sides. (This will require turning frequently and you'll want to use a tong to avoid burns). 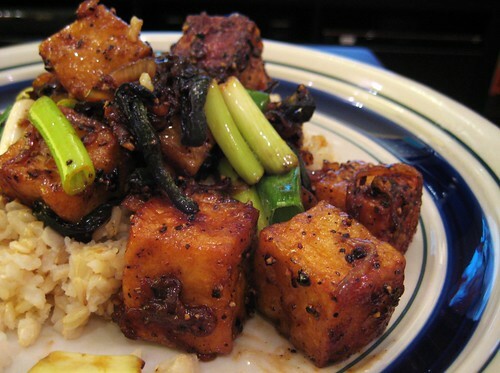 Place fried tofu on a paper towel to drain, cover with another paper towel and set aside. Pour out excess oil and carefully wipe skillet with a paper towel. Return skillet to medium heat and add butter. Allow butter to melt and then add ginger, shallots, garlic, and poblano. Cook until soft and shallots are beginning to caramelize, about 15-20 minutes. Stir in black pepper, soy sauces, and sugar. Return tofu to skillet and toss to coat. Cook, stirring, until fully combined and warmed, 2 - 3 minutes. Stir in scallions & serve over brown basmati rice. About 3 months ago, we moved... and I had this whole big blog dilemma - my blog's name is Kitchen Hell because cooking in my tiny kitchen was hell! But the new apartment? we pretty much bought it 50% for the kitchen, 30% for its proximity to the Greenmarket and 20% for the view... Notice that means that 70% of why we bought this particular apartment is food related... which means hell no more, right? Prepare pizza tray and set aside. Toss/stretch crust to desired size/shape and place on pizza tray. 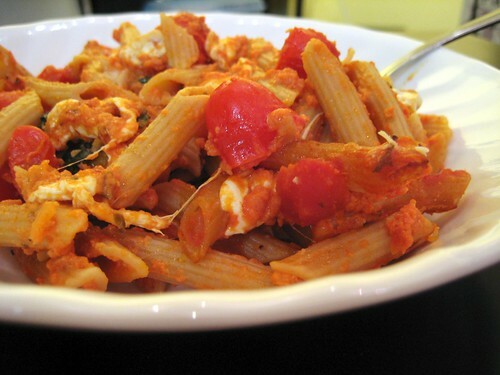 Place ricotta, 1/4 c parmesan and 1/2 c mozzarella in a medium mixing bowl. Drain artichokes and roughly chop. Wrap in paper towels and squeeze to eliminate moisture. Add artichokes to cheeses and stir to combine. Set aside. Heat a large skillet w/ 1 tbsp olive oil over med-low heat. Add in shallots with a pinch of salt and cook until soft and translucent, about 5 minutes. Add in tomatoes and allow to cook for another minute or two. Add spinach, tossing to coat and cook until spinach is wilted. Remove from heat and add spinach mixture to the bowl with the cheese/artichoke mixture. Season with salt and pepper and stir to combine. Drizzle pizza dough with 1 tbsp olive oil. 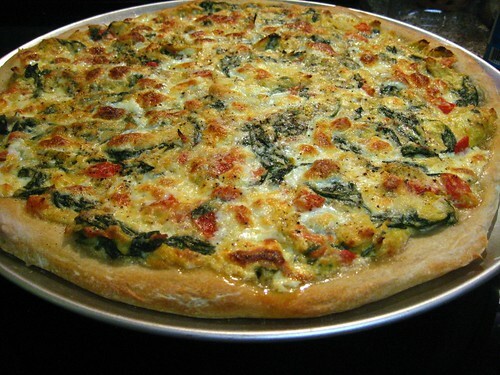 Spread cheese/spinach/artichoke mixture evenly over top. 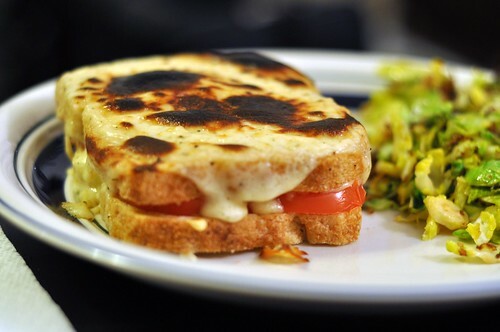 Cover with remaining mozzarella and parmesan. Bake for 25-30 minutes, or until cheese is golden and bubbly and crust is a bit crispy. Allow to sit 5 mins before serving. So, you know how there really wasn't much winter this year? Its been like, November (but without the rain), all winter long. This version is my favorite of all of the ones I've had since leaving paris (admittedly, there havent been that many, but this one is good, i promise!) and will probably become my new standard, not to mention a regular part of the 'ew, gross! couch! comfort food!' rotation. Toast your bread in the oven on a cookie sheet - 5 minutes on the first side, then 2 minutes on the opposite side. Set aside. In a small saucepan set over low heat, melt the butter and then add the flour, stirring constantly with a wooden spoon for ~2 minutes. Slowly pour the warm milk into the pan with the butter/flour mixture and cook, whisking constantly, until the sauce is thickened, about 3 - 5 minutes. Remove from heat and add the salt, pepper, nutmeg and stir. Add in 1/4 c of the Gruyere, 1/4 c of the Emmentaler and all of the Parmesan and stir until cheese has all melted. Set aside. Spread dijon mustard on all of the bread. On half of the bread, lay out tomatoes on a single layer. Top the same slices with the remaining Gruyere and Emmentaler, about 1/3 of the total cheese on each. Top each 'loaded' slice with one of the dijon-only pieces of bread. Bake the sandwiches for 5 minutes. Switch your oven to broiler and broil for 3 to 5 minutes (depending on how close your heating element is to your sandwiches) or until the topping is bubbly and lightly browned. this is mine. kristen. in nyc. when i 'borrow' recipes, i'm sure to give credit where its due. i dont care what you do with the stuff i may have made up, just give me credit, okay?